Land is precious for any country and used by people for productivity and as a source of food, for place to live, for wood, for place to work. In India, before colonial rule the land used to be in the hands of the community as a whole. However during the British Raj, this was changed. Lord Carnwallies had introduced Permanent Land Settlement for Bengal, Bihar and Orissa in 1793. According to this the tax farmers appointed by the British rulers was converted as various Land Lords. Under this rule they had to pay fixed commission to East India Company. Thus these intermediaries were formed and called as Jagirdar / Jamindar. Emergence of Tenants: Following the Land Settlement Act, 1793, the farmers purchase lands from the Land Lords and hire it for their agricultural use. These people who hired the land were called tenants. Cash Tenents: They pay a fixed tax for the use and occupy of the land. Share - cash Tenants: They pay part of their rent in cash and other part as share of the crop. Crop - share Tenants: They pay a share of crops only. Croppers: They pay crop of the share. But they were not independent and work under the landlord. In India, there was a practice of land holdings from historic times and it was distributed in a highly unequal manner and have always been used as a source of social power. To get secure access to land for the poor and landless, policies of land reform were implemented to benefit poorer section of society since independence. After that a number of land reforms have been done by the government such as abolition of 'Zamindari' or middlemen as revenue collectors, imposing ceiling on landholdings and awarding of the surplus land's rights to landless, and tenancy reforms (Mearns, 1998). Land reform is described as redistribution of land from the rich to the poor. More broadly, it comprises of regulation of ownership, operation, leasing, sales, and inheritance of land (indeed, the redistribution of land itself requires legal changes). In an agricultural economy such as India with great dearth, and an unequal distribution, of land, coupled with a large mass of the rural population below the poverty line, there are enthralling financial and political opinions for land reform. Purpose of land reforms is efficient use of scarce land resource, redistributing agricultural land in favour of the less privileged class in general & cultivating class in particular. 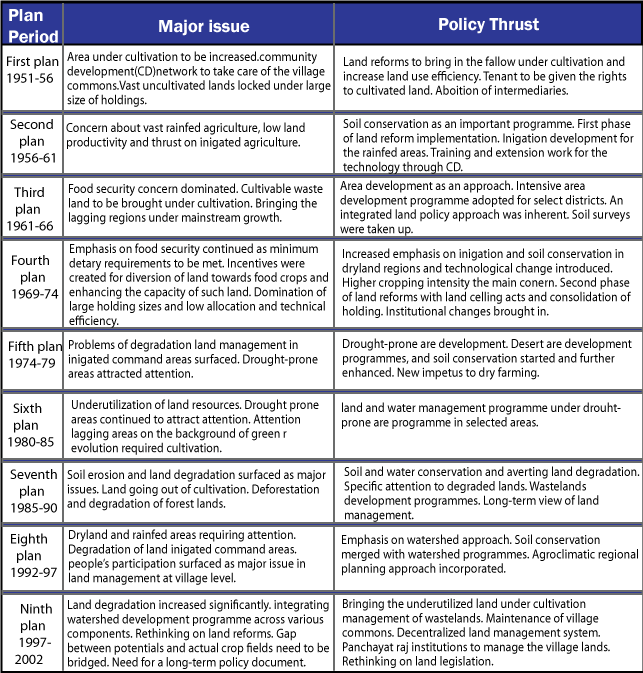 Land program in post-Independence India has evolved through different phases. During the Mughal period, before the arrival of the British there were numerous changes in the system of land taxation or revenue. Peasants continued to enjoy customary rights over land they occupied and generally could not be evicted unless they failed to pay the required land revenue (land tax) to the state. The task of collecting land revenue was assigned to a class of agents called zamindars (Bhaumik, 1993). When the East India Company (EIC) established in the Seventeenth Century, the agricultural structure underwent fundamental change. The EIC first purchased the right to receive the collected land revenue and later, under the Permanent Settlement introduced in 1793, declared the Zamindars to be proprietors of land in exchange for the payment of land revenue fixed in perpetuity. Zamindars, or those to whom they sold their proprietary rights, typically delegated revenue collection to a series of middlemen. The increasing layers of intermediaries meant that there was considerable increase in rent extracted from the tillers and failure to pay this increased amount resulted in large-scale evictions, widespread disturbance, and declining agricultural production (Bhaumik, 1993). The British sought to stabilize the situation through legislated tenancy reform. The Bengal Rent Act of 1859 placed restrictions on the power of landlords' to increase rent or evict tenants. However, the Act only protected fixed-rent tenants and did not protect bargadars or agricultural labourers. But it only protected those fixed-rent tenants who could prove they had cultivated the land for 12 consecutive years. Constant cultivation was difficult to prove due to poor records and the Act resulted in an increase in evictions by Zamindars to prevent tenants from possessing land for the required time period (Bhaumik, 1993). The 1885 Bengal Tenancy Act also sought to protect long-standing tenants, and was similarly ineffective. During this period, another form of landholder emerged in Bengal. The Jotedars were a rich class of peasants who reclaimed and gained control of large quantities of uncultivated forests and wetlands outside the territory governed by the Permanent Settlement (Bhaumik, 1993). The Jotedars refined some of this land through the direct supervision of hired labour or servants. Nevertheless, the bulk of the Jotedars' land, like much of the land in Bengal, was cultivated by Bargadars. Rural tensions over the dilemma of Bargadars were common in the decades prior to and after Independence. In the 1940s, the Tebhaga movement called for a smaller crop share payment and also created the slogan, "He who tills the land, owns the land." The movement is given credit for shaping post-Independence land reform legislation in West Bengal (Datta, 1988). At the time of Independence, this matter was of great significance. In the decades following independence India passed a significant body of land reform legislation. The 1949 Constitution left the adoption and implementation of land and tenancy reforms to state governments. This led to a lot of dissimilarity in the implementation of these reforms across states and over time. After India Independence, the government took major step to eradicate the systems of Jamindaris and Jagirdari, to remove intermediaries between state and peasant. This was the first legislature taken by almost all the states called as Abolition of Jamindari / Jagirdari systems Act. To make redistribution of Land to make a socialistic pattern of society. Such an effort will reduce the inequalities in ownership of land. To ensure land ceiling and take away the surplus land to be distributed among the small and marginal farmers. To legitimize tenancy with the ceiling limit. To register all the tenancy with the village Panchayats. To establish relation between tenancy and ceiling. Empowerment of women in the traditionally male driven society. To increase productivity of agriculture. To see that everyone can have a right on a piece of land. Protection of tribal by not allowing outsiders to take their land. Land reform legislation in India is categorized in to four main sections that include abolition of intermediaries who were rent collectors under the pre-Independence land revenue system, tenancy regulation that attempts to improve the contractual terms faced by tenants, including crop shares and security of tenure, a ceiling on landholdings with a view to redistributing surplus land to the landless and lastly, attempts to consolidate disparate landholdings. Abolition of intermediaries is generally established to be effective land reforms that has been relatively successful. The record in terms of the other components is mixed and varies across states and over time. Landowners naturally resisted the implementation of these reforms by directly using their political influence and also by using various methods of evasion and coercion, which included registering their own land under names of different relatives to bypass the ceiling, and shuffling tenants around different plots of land, so that they would not acquire incumbency rights as stipulated in the tenancy law. The success of land reform was driven by the political will of particular state administrations, the prominent achievers being the left-wing administrations in Kerala and West Bengal. At the time of independence, there existed many types of proprietary land tenures in the country. 1. Ryotwari: It was started in Madras since 1772 and was later extended to other states. Under this system, the responsibility of paying land revenue to the Government was of the cultivator himself and there was no intermediary between him and the state. The Ryot had full right regarding sale, transfer and leasing of land and could not be evicted from the land as long as he pays the land revenue. But the settlement of land revenue under Ryotwari system was done on temporary basis and was periodic after 20, 30 or 40 years. It was extended to Bombay Presidency. Mahalwari: This system was initiated by William Bentinck in Agra and Oudh and was later extended to Madhya Pradesh and Punjab. Under this system, the village communities held the village lands commonly and it was joint responsibility of these communities to make payments of the land revenue. The land ownership is held as joint ownership with the village body. The land can be cultivated by tenants who can pay cash / kind / share. Jamindari: Lord Cornwallis gave birth to Zamindari system in India. He introduced this system for the first time in 1793 in West Bengal and was later adopted in other states as well. Under this system, the land was held by a person who was responsible for the payment of land revenue. They could obtain the land mostly free of charge from the government during the British rule and it is called estate. Landlords never cultivated the land they owned and rented them out to the cultivators. The amount of land revenue may either be fixed once one for all when it was called permanent settlement or settlement with regard to land revenue may only be temporary and may, therefore, be revised after every 30-40 years, as the practice may be. The Zamindari system is known as absentee landlordism. Under this system the whole village was under one landlord. The persons interested can work in the Jamindar's land as tenant / labourer based on the agreement with the jamindar. The jamindari system was known to be more exploitive, as the jaminder used to fix / hike the prices of land according to his desire. Jagirdari: It is similar to Jamindari system. The jagirdar is powered to control the unproductive masses of village by engaging them in agricultural activities. Because land is controlled by state in India and the relationship between production and land tenure varies from state to state, the national policy recommendations resulted in differing tenancy reform laws in each state. Tenancy is completely banned in some states but completely free in others. Punjab and Haryana have not forbidden tenancy whereas Karnataka has a near complete ban on tenancy. Some states have discussed ownership rights on tenant cultivators except for sharecroppers, whereas West Bengal chose to provide owner-like rights only to the sharecroppers. Tenancy reforms may have indirect effects in the form of reduced tenancy shares if poorly implemented. Most tenancy reform laws also contained provisions concerning the ability of tenants to surrender the land back to the landlord voluntarily. These provisions were used by landlords to wane the impact of the laws. In most states the surrender of land falls under the jurisdiction of the revenue authorities. Following ere the outcomes of Land Reforms in India. The powerful Jamindars and Jagirdars have become inexistent. The abolition of intermediaries has stopped exploitation. Transfer of land to peasants from intermediaries has reduced disparities. The new proprietorship has given scope for innovation in Land Reforms. The ex-jagirdars and ex-Jamindars have engaged themselves actively in other work thus contributing for National Growth. The abolishment of these systems has increased to the new land owners thus adding revenue to the state governments. Land is a source of Income in rural India land and it provides employment opportunities. Therefore it is important for the marginal farmers, agricultural labourers, and small farmers. The concept 'ceiling on land holdings' denotes to the legally stipulated maximum size beyond which no individual farmer or farm household can hold any land. The objective of such ceiling is to promote economic growth with social justice. Land Ceiling should be imposed on all kinds of lands such as Fallow, Uncultivable, irrigated and Cultivable land. All the mentioned are inclusive of ceiling Act. The ceiling act varies from state to state on ceiling on two crops a year land. However in most of the places the ceiling is 18 Acres. Land possession and social power: It is observed that the land is not only the source of production but also for generating power in the community. In the Indian system, the land is often transferred from one generation to another generation. However all this lack the documentation of possession of land. In this framework, the government had made it mandatory to register all tenancy arrangements. To summarize, Land reform is the major step of government to assist people living under adverse conditions. It is basically redistribution of land from those who have excess of land to those who do not possess with the objective of increasing the income and bargaining power of the rural poor. The purpose of land reform is to help weaker section of society and do justice in land distribution. Government land policies are implemented to make more rational use of the scarce land resources by affecting conditions of holdings, imposing ceilings and grounds on holdings so that cultivation can be done in the most economical manner.